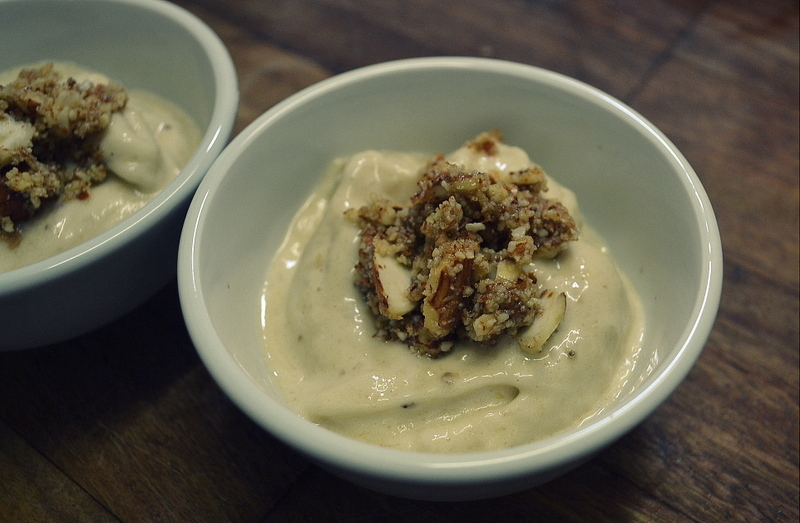 Banana ice cream with salted maple almonds…. Not really the weather for it but I couldn’t resist trying out this ice-cream recipe. How could I resist the smooth soft-serve-like texture of this banana ice cream topped with crunchy salted maple almonds… Ridiculously delish! 1/4 cup roasted almonds, finely chopped – Mine weren’t roasted, but just as delish! Place banana slices in a single layer on a plate, freeze for at least 3 hours. In a bowl, combine almonds, 2 tsp syrup and salt. In a food processor, pulse frozen banana slices, milk, vanilla and remaining 2 tbsp syrup, scraping down the sides as necessary, until mixture is the texture of soft-serve ice cream. Spoon into bowls; sprinkle with almond mixture. Left overs were put into ice block moulds to be enjoyed at a later date.